Your Rentlio account can be managed by several different people at once. 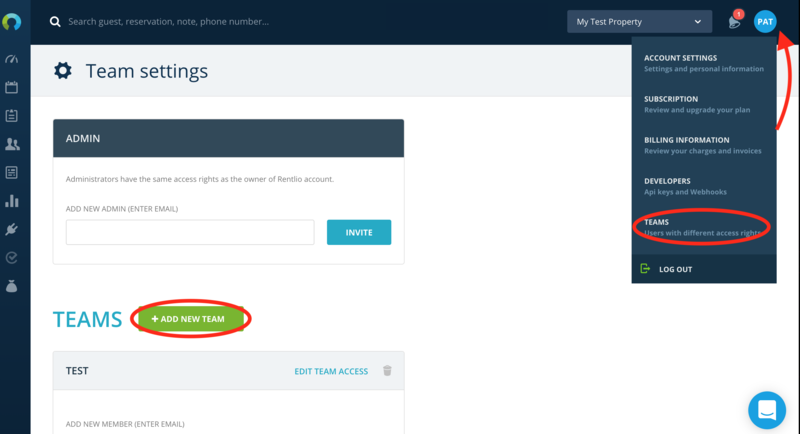 To use this feature you have to set up teams, assign users to teams and give them (different) user rights. Click on the top-right icon in Rentlio and select Teams. Here you can create different teams by clicking Add New Team, you can invite new administrators by entering their e-mail addresses and edit rights for each created team. name the team, par ex. "Reception"
add user rights - there are two rights, "view" and "edit". The difference is that editing rights allow team members to modify data, while viewing rights do not allow editing data. When you create and save a new team you have to invite team members to join that team. You do it by entering their e-mail addresses. Each team member will get an e-mail invite from Rentlio with a link. By clicking on the link and entering their (private) e-mail address and setting up password they will gain access to your property/properties. You can remove team members from the team by deleting their e-mail address on Teams screen and you can modify user rights for each team at any time.